We get an early hands-on with this intriguing match-three shoot 'em-up. Of all the genre mash-ups we've enjoyed over the last few weeks, our chance to get an early hands-on with Barrel of Donkeys' Toybox represents perhaps the oddest experience of the lot. Mixing a match-three Tetris game on one side of the screen with a bullet hell shooter on the other, you might wonder how on earth this most unlikely of combinations plays out. In the opening tutorial, the developer describes the experience as being a bit like rubbing your head and patting your tummy at the same time. They're not wrong, and at first you'll find yourself all fingers and thumbs as you attempt to keep an eye on two very different kinds of gaming action. Here's how the shooter part of the game works. 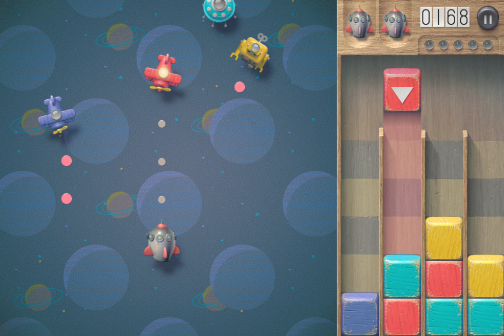 With your left thumb, you control a toy ship on the left-hand side of the screen as an assortment of different colored toys, from planes to UFOs, swarm onto the screen. If your automatically-firing vessel takes one of them out, a block matching the color of the ship you've destroyed appears on the right-hand side of the screen. Still with us? Good. Now, on the right-hand side of the screen, you have four different vertical racks. With your right thumb, you need to slide the tile into the preferred slot, and then tap the screen to let it drop. Once you've piled up three blocks of the same color, the tiles evaporate and the points are added to your tally. 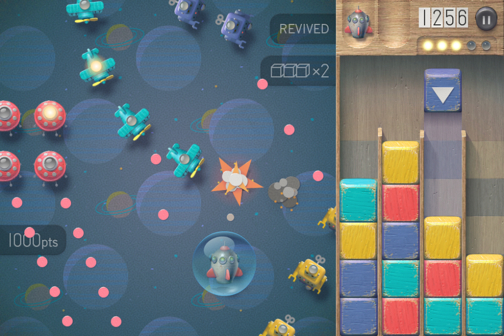 You only have a few lives to play with before the game ends, and you'll have to deal with increasingly feverish swarms that pack more and more bullets onto the screen. One hit will remove one of your lives, but fortunately you receive weapon upgrades of your own as you successfully clear columns of blocks. It's a bizarre but very compelling experience as you try to keep one pair of eyes on two very different games, and react accordingly. We're intrigued to see how the weekly high-score level model turns out over extended sessions, but we can certainly say that Toybox is going to bring something very different to the App Store when it releases later this month. We'll bring you a review of the game just as soon as the full version is on sale, but suffice to say this is one game you definitely want to keep an eye out for.